An American River College student gave a presentation last week on her three-day experience at NASA’s Jet Propulsion Laboratory (JPL), in Pasadena, CA. 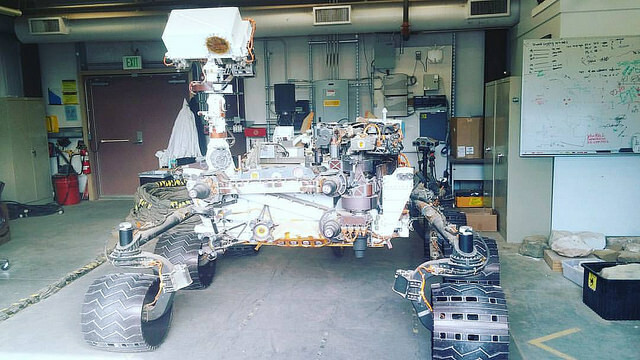 At JPL, students were split up into five groups and tasked with building a rover that they thought would be successful on a mission to Mars. Thompson’s group was the overall winner of the program and each student was awarded with a certificate and a copy Andy Weir’s novel “The Martian” signed by Matt Damon, who starred in the film adaption of the novel. The process of actually being accepted to the program is a journey in and of itself. The application process is broken up into two parts. The first portion is a six-week online course where the applicant has to read information and take a quiz at the end of each of the first four weeks and the last two weeks he or she has to create their own Mars mission. The best from the online portion are then given the chance to design their own rover with the best moving onto to the actually onsite program. Thompson said that the program officials really stressed teamwork while building the rovers. ARC Design Tech Professor and Engineering Club Adviser Randy Schuster praised Thompson for doing so well. Math Engineering Science Achievement (MESA) Coordinator Will Davis said that the program is a great opportunity for students like Thompson to get a taste of what the professional world is like. Davis also highlighted how the program can possibly open up future career opportunities for those who attend. Schuster said that Thompson’s achievement at the NASA program is just another example of the great work that ARC students do. Be the first to comment on "ARC student soars at NASA program"